The Philippine SME & Franchise Expo is now on it's third year and is organized by Tradecon, a Philippine based events company. On October 27 to 29, 2011 at the Philippine International Convention Center (PICC), Bartolome has taken time out to meet and share ideas and success stories with visitors. There are also other dynamic speakers invited to give a free seminar on topics like trademark, Corporate Social Responsibility (CSR) and even how to be a successful franchisee. The 3rd Philippine SME and Franchise Expo will showcase the emerging franchise concepts, business trends for prospective entrepreneurs. This event is an annual activity that provides a venue to build and enhance a business network. Philippine SME & Franchise Expo 2011 provides your company the opportunity and platform to position your new leads and relationships through refreshing ideas and present your products. In addition, this is a chance to have a face-to-face with new and budding entrepreneurs in the business industry. Philippine SME & Franchise Expo 2011 creates a dynamic environment where commerce is the result of bringing the community together to make vital connections. This specialized event will also be the venue of learning occasion for the visitors to acquire new leads and relationship through awareness campaign on new business ventures. Moreover, a great deal of free services, workshops and seminars, free educational, classes and new product launches will also be highlighted during the expo as it promises to be the right avenue to increase the exposure of SME products in domestic and foreign markets, and to improve the distribution of SME products between local manufacturing and trade sectors as well as within each sector. This will surely be a good news for small and medium enterprises that would like to gain new business ideas and showcase their products. Members of the FIP like Mang Inasal, Fiorgelato, Potato Corner, VCargo, Lay Bare, Generika, Cut, Bibingkinitan, Julie’s Bakeshop, Freshka, Baliwag, Chicco di Caffe, Baliwag Lechon Manok, El Bono Pizza, Unigosyo, Chichariffic and the newest member Chicken Deli of Bacolod will be joining the roasters of participants and exhibitors of the Philippine SME & Franchise Expo 2011. Be a part of this annual expo and come out a well-equipped and well-informed entrepreneur! 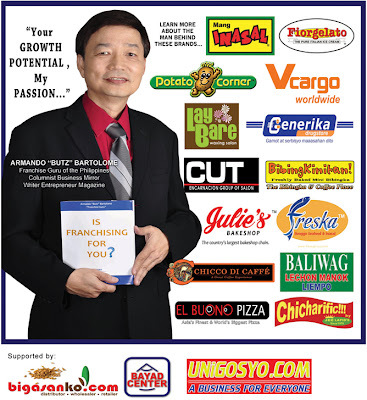 Come and Visit Philippine SME and Franchise Expo, October 27-29, 2011 at the Philippine International Convention Center (PICC) and to know more about the 3-Day event and to register for free visit http://www.smexpoph.com and don’t miss the chance of this jam-packed business seminars and activities that might bring you fortune you all waited for. You can also call (02) 6338547 for inquiries. This is really a great idea! Kudos to Bartolome and his team!